Scamwatch is warning consumers to beware of scammers pretending to be from Microsoft, with the latest round of scams based around the current Microsoft Windows 10 system upgrade. Scammers often adapt their methods based on real word events and they are taking advantage of a Microsoft offer that provides a free upgrade to the new Windows 10 operating system. Microsoft is rolling out the upgrades by allowing users of Windows 7 and Windows 8.1 to register their interest in upgrading and then putting them into a queue. Going into the queue means users must wait their turn for the free upgrade. Scammers are taking advantage of this by sending out emails claiming they can fast track the upgrade if you follow a link and download an installer program. If you click on the link you are taken to a fake website that looks like the real deal, complete with logos and branding. If you download the software, your computer will be infected with malware. Alternatively victims may receive a phone call from a scammer claiming to represent Microsoft. The scammer will tell you that Microsoft has detected an illegal download of the new operating system and unless they follow instructions to uninstall it, they will be charged a hefty fee. The scammer then directs victims to a website where they are told to download what turns out to be malware or ransomware. Scammers have also updated their approach to the remote access scam. They are now claiming security issues in Windows 10 has caused problems which they can fix for a fee. You receive an email or phone call claiming either that you can get a Windows 10 upgrade sooner, or, that there is some problem with your installation of Windows 10. You will be directed to click on a link or visit a website to download software. The software is ransomware which will lock you out of your computer and demand a payment. If you pay, you will lose every cent that you send. If you have clicked on an infected link or file, you may also compromise your device’s security in other ways. Do not open attachments or click on links in emails without checking very carefully first for signs of a scam. Look at email addresses closely to see if they are trying to mimic the real email addresses used by legitimate companies or organisations. If in doubt, check with the company or organisation directly using contact details you find yourself. Be wary of unsolicited approaches which direct you to download software. Microsoft will not call you about fixing your computer issues. Never give remote access to your computer to anyone you don’t know. Keep your office networks, computers, and mobile devices secure. Update your security software, change passwords and back up your data regularly. Store your backups offsite and offline. 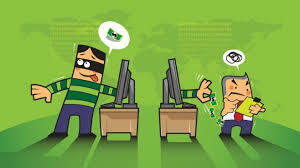 Stay Smart Online explains how toback-up your data (link is external). You can report scams to the ACCC via the SCAMwatch report a scam page or by calling 1300 795 995.